More than 2,400 homes rented by the Ministry of Defence have been left empty for over a year at a cost of millions of pounds, the BBC has found. More than 100 properties have been unoccupied for longer than a decade. The figures have been obtained under the Freedom of Information Act. Some houses are in such poor repair they cannot be lived in. The government says it has to keep them empty for families coming back from abroad and moving between postings. At 48 flats in Putney in south London, the carpets are clean and the paint looks fresh. The grass is freshly mown in the children's playground. But they are all empty. The BBC understands that has been the case since 2004. Windows are open in some blocks. Several doors to the communal areas are not locked. Post and advertising flyers dating back to 2005 lie in piles on the floor. "I think it's absolutely disgusting," says one local woman who does not want to be named. "They should sell these off and they'd be worth an absolute fortune." The blocks are owned by a private company and rented by the MoD for service families. The government sold off all its service family housing in England and Wales in 1996 to Annington Homes. It now rents back about 41,000. Today, 7,489 are unoccupied. The MoD can end a lease with six months' notice and hand them back to Annington. After a request under the Freedom of Information Act, BBC News has learned that 2,410 have been empty for more than year. Six hundred have been empty for more than three years and 104 for over a decade. The total cost of rent, maintenance and council tax over the last 12 months alone is £13.7m. The MoD says it knows there are too many empty homes and is "actively on the case". Officials maintain they are trying to match the numbers of houses to the changing needs of the military, in the most cost effective way. They also point out the MoD has to keep a large number vacant because of what it calls "churn" - that is, the high tempo of deployments back from overseas and within the UK. As for the 104 houses which have been empty for more than 10 years, many are behind the security fences on sensitive bases so cannot be handed back. But even when it does terminate leases, the MoD still has to pay for repairs. 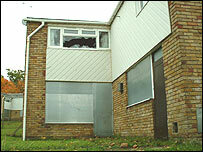 Fifty houses near Pirbright in Surrey have been empty since 2004. Windows are broken, doors are boarded up and walls have collapsed. 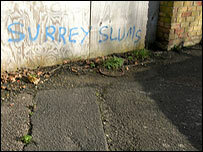 There is fresh graffiti which says "Surrey Slums". The MoD has now decided to give notice and will hand these back by the end of the year. But it will have to pay for repairs. Last year, the average bill for dilapidations was more than £6,000 per house. "Sure they have to mothball housing - but they don't have to leave it empty," says David Ireland, who runs the Empty Homes Agency. The agency is a charity set up to try and make the best use of vacant property. Mr Ireland believes the MoD could sub-let to civilians for as little as three months. "It provides housing for a group of people who otherwise don't get housed, and for the military it's got someone living on site taking care of it," he adds. Last year, the Defence Select Committee also criticised the MoD's management of its housing stock. It said there were too many empty properties. Some accommodation was described as appalling. 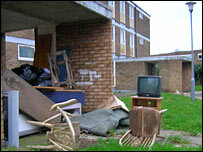 The MoD points out it is spending £50m this year on improving family housing. It aims to start sub-letting some empty homes to civilians in the summer.